I took a long overdue trip up here to Birmingham last Friday. The timing worked out perfectly since Debby was about to rear her ugly head in the gulf, and what was supposed to be a long weekend trip, has turned into a week-long stay. And I must say, it's been a quite productive trip so far. I'm excited to share with you guys what I've been up to since I've been here but until then, I thought I'd show you one of my scores on a recent shopping excursion. 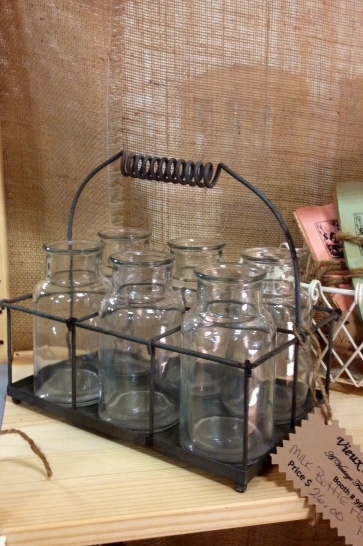 I've been looking for a milk bottle carrier for a long time now. I've been searching on Etsy, Ebay, decor sites, etc. to no avail. I could never find what I was looking for...until Saturday! Me and my friend Bekah stopped into a consignment/antique store to check out some furniture and while purusing the booths, I stumbled upon this guy. His $26.00 price tag had me at "hello"--Pottery Barn is currently selling a galvanized bottle carrier for $29.50 and that doesn't even include bottles. Plus, I love that mine is the real deal and not a replication. I can't wait to fill this guy with some pretty summer flowers. Hooray for great finds!